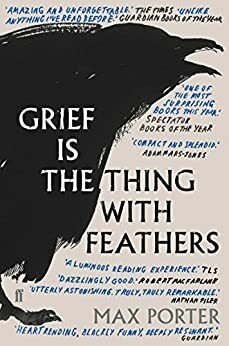 Grief Is The Thing With Feathers by Max Porter is not a novel as such, more a series of vignettes that form a rumination on loss and grief. 'Dad' is in the process of writing a book about Ted Hughes when his wife dies suddenly, leaving him a widowed single father to two sons, collectively called 'Boys' in the text. Just as Dad thinks his grief is too much to bear, a visitor arrives uninvited: 'Crow', who has left the pages of Hughes' famous poetry collection to stay with the family "until you don't need me any more". It's up the reader to decide whether Crow is real, symbolic, or a imaginary manifestation of Dad's obsession, but certainly he seems almost uncomfortably physical, literally knocking Dad off his feet and overwhelming him with his clumsy, feathery embrace and his stink of "just-beyond-edible-food, and moss, and leather, and yeast". What follows is a collection of observations from Dad, Boys and Crow that articulate their feelings in the wake of Mum's death - not just in the immediate aftermath, but right up until Boys are grown up and making sure their late Mum becomes Granny at the same time Dad becomes Grandad. Some are desperately sad, some are tempered with humour (the time, for instance, when Boys think their father might have died too until a fart reveals he's only sleeping) and some are painfully honest (such as the time the boys trap and kill a fish in a delayed expression of anger and bitterness). Each piece is presented as free verse or prose poem, with some requiring more thought than others and having many different possible interpretations. This is an unusual book and I'm sure it won't be to everyone's taste, but I loved it and thought it was beautifully written. It's very touching and profoundly thoughtful, and at times it's a little unnerving. Crow can be quite an ambiguous figure and his narrative can be violent and visceral as you'd expect that of a carrion eater to be. Sometimes he is immensely kind - he's a sentimental bird, he often tells us - and sometimes he's a capricious trickster. Sometimes he's fiercely protective, sometimes dangerous and unpredictable. The use of language in this book means that it requires some thought (and probably re-reading) to really get to grips with it - it's almost as much about the difficulty of writing about grief as it is about grief itself, and that's reflected in the author's style. You will also possibly get a little more out of it if you're familiar with Ted Hughes and his work. But this slim little volume of barely more than 100 pages was one of the most captivating and thought-provoking things I'd read for a long time, and almost entirely like anything else with which I'm familiar. The thing it reminded me of most was Rebecca Hunt's excellent Mr Chartwell, but even that is really very different indeed in form and tone. Don't expect to buy this book and get a clear, unambiguous story with a discernible plot, and don't expect it to offer all the answers about death and grief, either - what it mostly tells you is that a bereaved family will just have to muddle through and that the loss of a loved one will never stop being sad, although there's a strong thread of hope that weaves through the book as a whole and ultimately I found it a profoundly life-affirming read. I'll return to this book many times, I'm sure.